An Al Hanissim supplement for Sheva Asar b’Tamuz that acknowledges the fast day in light of the apparent achievements of the State of Israel, post-1948. . . . Flash floods are dangerous in every season, but are rare in the dry season, after most rain and snow are thought to have fallen. Changes in the global climate due to global warming caused by anthropogenic activities such as the burning of fossil fuels and the conversion of land for raising animals for their meat is a significant contributor to extreme weather experienced around the world. The Masorti Movement of Israel’s prayer for flood victims was first published on their website, here. . . . 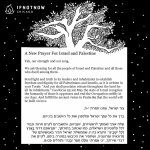 This prayer for planting was composed by Zeev Kainan for Tu biShvat (2018) for the Masorti Movement for Conservative Judaism in Israel. . . .
On 29 September 2017 IfNotNow Chicago writes, “Tonight begins Yom Kippur. We are asking our community, when you say the prayer for Israel this Kol Nidre, will you say it for all the people that live in Israel and Palestine? Will you stand for freedom and dignity for all Palestinians and Israelis? Our members have re-imagined the Prayer for the State of Israel. We hope you use this New Prayer for Israel and Palestine, and share it with your own community.” . . .
Ramadan Mubarak رمضان مبارك. “A Jewish Prayer for the Month of Ramadan” with its English translation was first published by Rav Hanan Schlesinger​ on his website, “Breaking Bread and Barriers: Solidarity through Prayer” on 15 June 2017, and composed by him for a Muslim-Jewish Iftar​ (break-fast) on 14 June 2017. . . . Categories: Justice and Peace, War, Conflicts over Sovereignty and Dispossession | Tags: Israel, English Translation, Medinat Yisrael, Erets Yisrael, Yovel, Six Day War, 21st century C.E., 58th century A.M.
“A prayer on the 50th anniversary of the Six Day War” by Rabbi Ofer Sabath Beit Halachmi was first read on 11 Sivan 5777 (June 5th 2017) and published on his Facebook page. English translation: Rabbi Rachel Sabath Beit-Halachmi, Rabbi Andrea Coustan London and Daniel London. . . . The Prayer for the Fire (תפילה לעת שרפה) was first published by the Masorti Foundation at their website here in response to the November 2016 wildfires in Israel. Translation by Rabbi Jonah Rank. Transcription by Aharon Varady. . . .
A translation in Arabic and English of Rabbi Nava Hafetz’s prayer for the children of the world: Creator of all life, sovereign of peace, Bless our children and the children of all the world With physical, emotional, and spiritual health. You who created them in Your image And lovingly imbued them with Your spirit, Let their paths be successful in this world that You created. Give them of Your resilience and strengthen the sinews of their bodies and minds. Guard and save them from all evil For Your mercy and truth abound. Grant peace to the Land and everlasting happiness to all its inhabitants. Amen, may it be Your will . . . Categories: Erev Shabbat, Conflicts over Sovereignty and Dispossession | Tags: kindling, Palestine, candles, Erets Yisrael, 21st century C.E., 58th century A.M.
Two mothers, one plea: Now, more than ever, during these days of so much crying, on the day that is sacred to both our religions, Friday, Sabbath Eve Let us light a candle in every home – for peace: A candle to illuminate our future, face to face, A candle across borders, beyond fear. From our family homes and houses of worship Let us light each other up Let these candles be a lighthouse to our spirit Until we all arrive at the sanctuary of peace. . . . Categories: Rosh haShanah for Ilanot (Fruit Trees) a/k/a Tu biShvat, Conflicts over Sovereignty and Dispossession | Tags: Ecumenical, Medinat Yisrael, Progressive Zionism, Erets Yisrael, Planting, teḥinot, 21st century C.E., 58th century A.M. In the wake of the continued uprooting of fruit trees and human settlements in the Land of Israel, T’ruah: The Rabbinic Call for Human Rights shared the following petitionary prayer. . . .